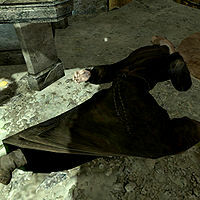 Stromm was a Breton conjurer who, along with other mages from Markarth, ignored the advice of Calcelmo and ventured into the Dwarven ruin Nchuand-Zel. He stayed behind to study the living quarters of the ruin while his colleagues forged ahead. He kept a diary during their journey into the ruin, which recorded, among other things, their fight against the Falmer, a fight they eventually lost. This page was last modified on 27 January 2016, at 20:40.